Simplify3D has had this feature for ages, admittedly you need to set up the layer heights but it works really well. It is also a really handy feature to recover from a failed print. Even better you can adjust the infill and wall thickness for each layer so as to increase the strength of the part. It would be nice to some day be able to adjust the infill of a layer based on zones so if you had say an arm that was quite thin you could give it a really fine infill and the body part of the layer could have a larger infill. And at some stage it wold be nice to have the ability to add/print a support at an angle or between two surfaces but then that having Meshmixer allows you to create tree supports with ease and save on a crap ton of material. Are there any cons to leaving this enabled all the time? I’m a bit confused it took so many years to come up with something so obvious, but on the other hand I have never worked with a 3D printer beyond handing over STL files to someone who owns one. It sounds more useful to do just the outer edge in 2 or 3 thin passes, while doing all infill with the normal tick layer height, instead of varying the thickness of the whole layer. Typically you run your outer facing walls at a much slower speed to preserve quality. 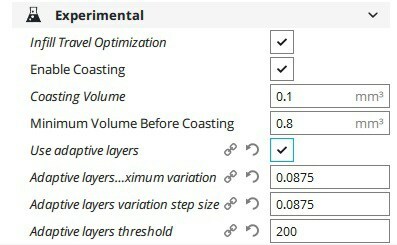 So you wouldn’t see the speed improvement like you would with adaptive layer heights. Kisslicer has an option to do this. It’s called stacked layers. Although, I do believe it is a PRO feature.